I have a special treat for EDIWTB today. I am participating in a blog post series called Summer Shorts. In this series, a new short story has been featured every day on a different blog, featuring an audiobook narrator reading the work of one of his or her favorite authors. Readers have listened to a different short story for free each day, and can buy the whole collection from Tantor (with 20 additional bonus tracks) for $9.99 (effective through TOMORROW, June 30; after tomorrow the price goes up to $19.99). 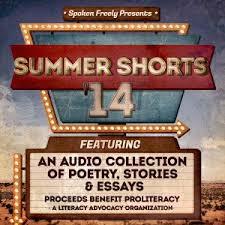 Proceeds from the purchases will support ProLiteracy, a literacy outreach and advocacy organization. Here are all of the posts in this series to date. Yesterday’s post was at Miss Susie’s Readings and Observations. I am so excited to be able to feature a Q&A with both the author AND the narrator of this story. It was fascinating to ask the same questions of both the woman who wrote the words and the woman who spoke them. I hope that you enjoy the story and the interview! First, some background on the story, “Sharks and Seals”. It’s short. Really short. Like 3 minutes short. But so well-written, and memorable. It’s about a girl who is encouraged to join the water polo team in high school by a classmate, Stacia. They become friends, and she spends time at Stacia’s home, where she learns that some families are very different from her own. When a tragedy befalls Stacia, the main character stays in touch with Stacia’s family, maintaining the relationship that has had such an impact on her and opened her eyes to new possibilities in life. It’s a short story that really packs a punch, with each phrase – each word, even – contributing to the story without a single extraneous note. Like I said, it’s really short – listen to it. You will finish it before you know it. Here’s the Q&A with Susanna Daniel and Karen White about “Sharks and Seals”. Q. What was the inspiration for “Sharks and Seals”? Susanna: I was asked to write the story for a project called Significant Objects, which pairs garage-sale tchotchkes with short stories about those tchotchkes, then auctions off the pairs for charity. I had a photo of two novelty pens, and from that came my story, which is about love and loss — these are the topics of all my work to date, I think, though I’ve written only rarely about a young adult. Karen: I’ll let Susanna take that one, but I will say that I was very happy to learn that we’d be able to record contemporary fiction this year for Summer Shorts. I started looking around for short pieces online, and it occurred to me, duh, that I could try to find something by an author I’d already worked with and Susanna came to mind right away. I don’t remember how exactly I searched for it, but I ended up on this page with a photo of a shark and a seal pen and this story. I really loved it so I emailed Susanna and happily, both she and the original publisher were willing to let me record it for the Summer Shorts project. Susanna: There might come a time when I give a novel the setting of my daily life — landlocked in the Midwest — but I’m not sure it ever will. The water of the ocean, boats, stilt houses, swimming pools: this is the setting of my childhood, and the backdrop for every fictional world I’ve created to date. Parents and children and spouses and siblings — these are the relationships I find most compelling and consequential, in life and fiction. Karen: Well, I have to confess that while I love living near the water — walking on the beach and playing in the waves, I am NOT a fan of deep water and I am a pretty terrible swimmer. (Some combination of a bad swim team experience at a young age and reading the novel Jaws when I was 12.) On top of that I recorded Sea Creatures right after we’d moved from CA to NC. I grew up in central NC but now I’m on the coast, and reading the very intense descriptions of Hurricane Andrew kind of freaked me out. So I will definitely be evacuating if there’s any inkling of a big hurricane coming here, and praying that my house can take it! Q: Parenthood is also a common theme in Susanna’s work. Susanna, why are you drawn to parenthood so frequently in your storytelling? Karen, do you find yourself incorporating your own parenting persona into your performances of Susanna’s work? Susanna: I think I’m more specifically interested in how the family persona and the individual collide and coincide. In my second novel, Sea Creatures, the narrator, Georgia, has to find agency despite the fact that she’s become overwhelmed by her sometimes conflicting responsibilities to her husband and son. Parenting is one surefire way to put a characters’ weaknesses and strengths on display. Karen: I think what has always drawn me to acting (and narration, which to me is definitely acting) is that I am fascinated by how other people think. Acting gets me as close as one can get to experiencing how another person thinks. Obviously in narration we’re playing lots of roles, but in a first person narrative like Sea Creatures, I get to live more completely inside the head of the fictional narrator and let that person’s voice take over. So in some ways I let go of my own thought and speech patterns. That said, I think in the best scenarios, I am asked to record a book because when the powers that be read the book (or its description), they think of me and my voice. So I guess what results is some amalgamation of me and the character. I hope I’m not quite as screwed up as most of the mother roles I end up playing (and I have recorded quite a few books about mothers who have issues) but I do think I’m probably a pretty neurotic mom. For instance, I try REALLY hard not to be a helicopter parent, which is one of the things that drives me crazy in the world these days, but in avoidance of it, I probably do a LOT of overthinking. Nobody wants to live inside my head! Q: How much interaction do you two have when Karen is preparing to perform one of Susanna’s works? Susanna, do you give any direction about characters, motives, or specific scenes? Susanna: I’m not an actor and I have no experience with voice work – I leave that to the experts! Of course I answer any questions, like how something is pronounced. Karen: I just looked up our email exchange and I only asked her two pronunciation questions! In my opinion, when the writing is good, I don’t really need any other input. All the direction is there, and if anyone tries to impose anything on top of that, it often sticks out like it doesn’t belong. Even if Susanna were to share deleted scenes about characters, I’m not sure it would be useful because the reader doesn’t get those scenes. I think it’s like the narration has to fit inside the frame that the book has created and going outside of that frame is at best unnecessary and at worst, a distraction. Q: What are the challenges of writing and performing a short work like “Sharks and Seals”? Susanna: My biggest challenge was the word count — I don’t write short, generally. My narrators usually have a lot more room to breathe. It took about ten times as long to whittle down the word count as to write the first draft. Karen: What I loved about this story was that it was so low key and almost unemotional, and yet I could still feel all this stuff going on underneath. Simple and complex at the same time. For me, the challenge in recording a short story (and this is a really short one) is that there’s no warm-up time, you have to be in it completely from the get go. Also, I’ll confess that starting a book is always the hardest part for me because there’s usually an uncomfortable period while I’m figuring out the tone and pacing. It’s not unusual for me to do a first chapter and then start all over again if I feel like I didn’t get it. I think I recorded this one a few times before I felt like I had it. Q. Do you think that short fiction is better suited for our digital attention spans than full-length novels? Or is the focused escape of a novel more important now than ever? Susanna: Digitally or on paper, there’s really no substitute, for me, for a novel’s breadth — short stories can be very intense and artful, and sometimes, as a reader, I find them overpowering. I read more novels than stories, though I think I can learn more from a really smart short story than from anything else. Posted on June 29, 2014 by gayle. This entry was posted in Audiobooks, Fiction, Short Stories and tagged audiobook, Karen White, Q&A, Sharks and Seals, short stories, Summer Shorts 2014, Susanna Daniel. Bookmark the permalink. Thanks so much for hosting us Gayle! Just wanted to clarify that the Summer Shorts 2014 collection will still be available for purchase after 6/30, but the price will go up to $19.99. So get it on sale while you can – but know that all sales now and in the future will benefit ProLiteracy. Good information. Lucky me I found your blog by accident (stumbleupon).